Q. What are the flight times and how are they determined? The approximate flight time varies depending on the month and date of your flight. We will confirm the exact time with you but, in the meantime, you can check the approximate flight times (and when to show up ahead of the flight time) on our Approximate Flight Times page. The winds are the lightest at these times thus allowing us to be able to fly. Q. It would be great to have photos of our experience - I guess there's no way, is there? All flights are followed by a complimentary champagne, non-alcoholic drinks and hors d'oeuvres tailgate party. This provides a great opportunity for passengers to communicate with the pilots, crews and other passengers! Normally there are multiple balloons so passengers take photos of each other's hot air balloons and the photo exchange arrangements can start at the tailgate party with an exchange of email addresses. Q. Do you fly year round? A. Yes, weather permitting, we offer sunrise & sunset flights - seven (7) days per week, 365 days a year. The flying times will vary with the season. Q. Is it too cold to fly in the winter? No, the balloon requires less heat with the colder air. Less burner time means a quieter flight. Some of the cold you feel on the ground comes from the wind, up there you move with the wind. Floating above the snow covered countryside is special. Q. What is the best way to contact you? A. Call 888-301-2383, all flights are personalized and require specific information (accepting calls from 9 am to 7 pm daily). Q. How long does the flight last? A. The whole experience, from helping with the inflation (optional), to the last of the champagne takes about 3 hours. Actual flight time is an hour +or-, determined by possible landing spots in the direction of flight. When we depart, we never know where we are going to land. Every flight is an adventure, even for the pilot! Q. Will we be the only passengers? A. Yes. If you choose an exclusive flight. This is your option. Q. How much ballooning experience do you have? A. We have been flying balloons since 1987. A. Yes, all of our pilots are licensed and insured. Q. Is the launch site licensed? A. Yes, The State of NJ requires commercial operators to fly from a licensed balloon port. Q. Where do we fly? A. Over the rolling hills and small towns of scenic Hunterdon County near the Spruce Run Reservoir. Q. Can you handle special requests? A. You bet, just call and ask us. Q. When is the best time to fly, sunrise or before sunset? A. Both times are great! We prefer sunrise, sometimes a large fog hangs over Spruce Run Reservoir making the flight even more serene. Q. Should I be concerned about motion sickness? A. Not at all. There is no feeling of motion during the flight. Q. What if I have a fear of height? A. A lot of people express this concern. Ballooning is a very relaxing sport, sometimes passengers aren't even aware they have left the ground. Let the pilot know before the flight, he/she will stay low until you are comfortable. Q. Are reservations and deposit required? Q. Is it possible to make a reservation and fly on the same day? A. Yes it is possible, depending on balloon/pilot availability. Q. 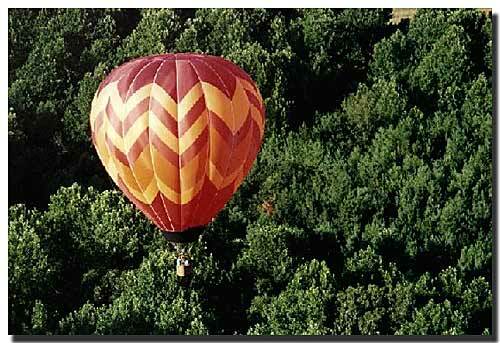 Why should I choose In Flight Balloon Adventures LLC to pilot my balloon adventure. A. Please see our Rates page that outlines the important considerations in choosing a balloon company.